We’ve been waiting all year for Reynaldo Lopez to show up in Chicago and he came out with guns blazing in his 2017 debut, fanning five in his first six outs en route to allowing just two earned runs in six frames. Plenty are buying into the hype Lopez has garnered after his first start, but is he for real? Is Lopez someone you can count on down the stretch in your fantasy league? Let’s walkthrough the entirety of Lopez’s 2017 MLB debut with plenty of GIFs to help us out. There’s a lot to discuss just from this image alone. 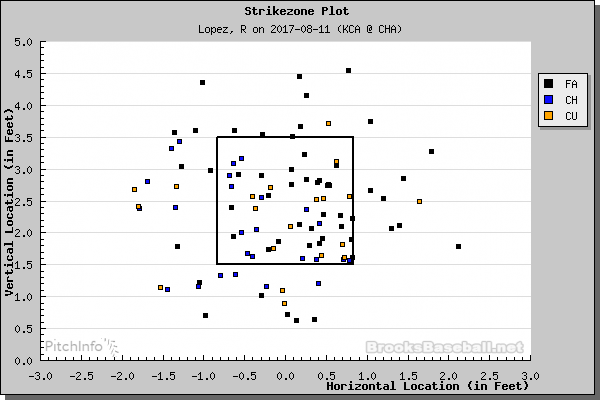 1) Lopez threw plenty of pitches in the zone, with a heavy emphasis on down-and-glove-side. This may mean Lopez struggles to hit the inside corner against right-handers or maybe it wasn’t his plan of attack for the evening. 2) Seeing this many Fastballs for strikes is a great sign, and there’s little reason why he shouldn’t have confidence with the pitch given its 96.5 mph average velocity. 3) Few pitches are located below the zone. That’s a bit of a problem considering we should be seeing Changeups and Curveballs under the zone to get whiffs constantly. 4) Curveballs were thrown with little consistency – six were simply poor pitches and plenty were up inside the zone. 5) His Changeup was elevated often, suggesting a lack of polish with the pitch. That might not seem like the most glowing review off the bat, though that first point is a major one – throwing strikes with confidence is the first step toward MLB dominance. Let’s see how the game played out as we take a look at Lopez inning-by-inning. His first pitch of the game was a Fastball that he got a little squeezed on for ball one, but the next three pitches set the tone for the entire game. He hits a Fastball outside, then just off the inside corner for a foul ball, then wanted a Changeup with two-strikes as Kevan Smith cycled through multiple options before Lopez saw the pitch he was looking for. That second pitch is excellent. It’s a free strike every time to right-handers as it rode a little extra into Merrifield’s hands, forcing a swing and what will either be a dribbler for an out or a foul ball every time. (Spoiler alert: This was one of the very few times Lopez executed this pitch across the entire start.) Not only does it get him to a pitcher’s count of 1-2 instead of a hitter’s count of 2-1, it now sets up an off-speed pitch away, which Lopez did with his Changeup. About that Changeup really quickly. I had my reservations about Lopez this season given what we saw in 2016: a pitcher with a hard Fastball, a solid breaking ball, but an inconsistent Changeup that needed work. Seeing a solid third pitch from Lopez in this start would be the biggest impetus for me to get on board for future starts. Alright back to the strikeout of Merrifield. It wasn’t the prettiest pitch you’ll see, but the fact that Lopez was trusting his Changeup first instead of his Curveball was a huge surprise, and a common theme through the game. You’ll notice the three dots in the same location as Lopez whizzed three Fastballs above 97mph. If Lopez can hit that consistently (he was 3 for 5 in this at-bat with his 0-0 pitch missing badly arm-side) things are going to come easy for Lopez. A minor detail to add here: when getting to two strikes, Lopez demanded a Changeup yet again…and overthrew it a bit as it sailed over the middle of the plate. Sure, it set up the heat low-and-away for the final blow, but this hinted at Lopez’s weakness for a mistake Changeup that we’ll see later in the game. After getting two quick strikes with elevated heaters to Eric Hosmer, Lopez threw four straight balls that lead to his first walk. What’s curious here is how Lopez still hasn’t thrown a breaking ball and elected to throw Changeups off the plate at 1-2 and 2-2, with the latter being a solid offering that Hosmer resisted. That’s four Changeups through sixteen pitches, all while ahead. Clearly it’s Lopez’s favorite putaway pitch and I absolutely adore seeing young arms have faith in an off-speed pitch, though I question if the pitch’s performance can back up his confidence. And on cue, Lopez shows off a first pitch breaking ball to Melky Cabrera. The pitch was tugged slightly as it was supposed to be outside, but it worked well as Cabrera wasn’t looking for one. Solid offering, not back-breaking, but definitely a pitch that will miss bats when located and sequenced correctly. The more impressive pitch was the 0-1 Fastball that followed as Lopez located it right to glove, generating a weak can-of-corn to shallow left field. He’s hitting the glove-side low corner with precision right out of the gate and it’s a fantastic first inning for Lopez. Alright, we may have a winner for my favorite at-bat of the game and it’s just the second inning. Lopez was right back at it against Mike Moustakas, getting two strikes quickly with down-and-in Fastballs, with some pretty pitches that badly jammed the left-handed slugger. After a few foul balls and a misplaced heater, Lopez located his Curveball in the perfect spot – right where his Fastballs had been prior and in Moustakas’ blind-spot for a well deserved strikeout. This is going to be a devastating combination against left-handers if Lopez can do this consistently. It’s too early to make a proper judgement, but man is this enticing. Lopez walked Cheslor Cuthbert in a full count, oddly with a Curveball that missed well inside instead of turning to his aformentioned Changeup. Lopez also attempted to throw his second arm-side Fastball of the game during this at-bat and missed poorly, tugging it to the middle of the plate and under the zone. It’s making me question if hitting arm-side with his heater is a facet of his game he has yet to develop. Lopez had previously gotten ahead 0-2 with a solid Curveball over the plate and dotting the low-outside corner once again, followed by a Fastball in the same spot that Escobar barely fouled off. Everything was perfectly set up for this high-and-tight heater and Lopez pulled it off. Like the strikeout to Moustakas, this is going to work a lot. Great to see Lopez hit the glove in every pitch to Escobar. He danced around with a few heaters and a badly thrown Changeup before throwing the pitch one more time over the plate that Gordon was well out in front of for his fifth strikeout of the game. It’s a small sample thus far but seeing Lopez command both sides of the plate with his Fastball, debilitate a slugger in Moustakas with his Curveball, and use his Changeup in any count, it’s hard not to fall for Lopez after his first six outs. Thus far, Lopez has shown that he can command his high-octane Fastball and has the secondary pitches to clean up with two-strikes or rely on either pitch to get ahead early. But now that he’s showed off his bag of tricks, the question becomes if batters can handle Lopez’s stuff when they have a sense of what’s coming. After getting a quick out on yet another well placed Fastball, Lopez allowed a five pitch walk to Merrifield. None of his offerings clicked in the same way he had showcased prior, which is going to happen. Still, not being to throw a 2-1 Fastball for a strike is disconcerting, especially when it was identical to the missed inside Fastball from before as he bounced it across the middle of the plate. There are two great things about executing this pitch. Either Lopez gets to two strikes where the world is his oyster and he can punch out Cain with anything he wants, or Cain offers at it and mostly likely rolls over the pitch, which could very easily result in an inning-ending double play. Well spotted Fastballs in the upper numbers will got the job done, but having pitches like these in your back-pocket brings starters to another level. After fanning Cain, Lopez abruptly ended the inning by getting his Curveball over the plate to Hosmer, who popped it up for the easy out. Tossing a no-hitter through the first three frames ain’t so bad. Lopez earned a quick first out with a Fastball right down the middle for strike one to Cabrera, followed by a hanging Curveball that was lofted to right-field for the out. It would have been a mistake pitch in normal circumstances, but Melky was well out in front after seeing 95mph just a moment ago. Velocity masks mistakes even when it isn’t being showcased. Lopez didn’t shut the door quick enough with his three previous pitches and he didn’t bury this pitch down in the zone – or even under the zone – leading to the first hit and run of the game. He may have been able to get away with this against another hitter and been punished with a single or double, but not Moustakas. Cuthbert was next and slapped a chopper to center on a solid 97mph heater along the outside corner. Nothing wrong here, just baseball being baseball. I was slightly worried now that Lopez could unravel a bit as young pitchers do (even though his performance thus far shouldn’t warrant it)…and the entire White Sox defense had the same idea, consoling Lopez on the hill. It’s not a good pitch as it should be at the bottom of the zone instead of staying up for long enough to lace for a hit. That’s two of his last three pitches that were hung Curveballs and he’ll need to make an adjustment with the pitch moving forward. Lopez really needed that out, especially from a 2-1 pitch that wasn’t well executed. It’s a vote of confidence that shows he doesn’t need to be perfect to get out of this inning and to trust his stuff. He opened the next at-bat to Drew Butera with a Curveball nearly identical to Escobar’s, but it was taken for strike one. He turned to the pitch again, where he executed it as it landed right on the outside corner…for ball one. It’s not fair. After a foul ball from a good outside Fastball, Lopez turned to the deuce one more time and earned a tall pop out to get out of the inning with the pitch over the middle of the plate. It would have been an easy strikeout if located properly under the strike zone, but just getting a strike with a breaking ball was enough to escape the jam. Lopez was far from his best in this inning, though it should be noted that his B-rated stuff was still good enough to survive. After a trio of fantastic innings, Lopez hit a rough patch in the fourth, where he turned away from overpowering primarily with his heater to featuring more Curveballs to confound hitters. It’s clearly a product of facing the lineup a second time, though I’d imagine as the lineup turns over again in the fifth, he’ll return to the bread and butter that worked so well to start the game. In the fifth I started picking up on something that I’m going to be watching for in future Lopez starts – Lopez can get to two strikes easily, but is having trouble putting batters away efficiently. In the first, his Fastball got the job done, but that pitch should be a secondary offering like his Curveball or Changeup. He was able to do it correctly once against Moustakas, but he’s lacking that “eye-of-the-tiger pitch” like we see with Luis Severino’s Slider or Jacob Faria’s Changeup, to name a few other young electric arms. That one pitch that batters know is coming and they still can’t hit it. It used to be his Curveball last year, but it’s lacking the polish thus far to firmly take the role. Lopez got to two strikes against Merrifield and eventual retired the infielder with a Changeup away for a flyout, but he is missing that last piece of the puzzle so far, limiting his ceiling. This is the same exact result as I’ve discussed twice previously and it’s clearly an issue with Lopez. He’s fearful of hitting the batter and overcompensating, resulting in him holding the ball a little too long and pulling it into the dirt. He can be successful without this ability, but it’s certainly a facet that’s missing from his skill set. 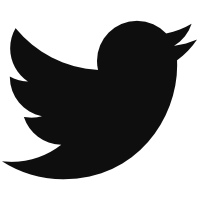 Did you catch it? Lopez’s glove is freezing slightly during the Fastball, pointing at the target a little longer before his shoulders open, while when throwing the Changeup there’s little-to-no hesitation with a smoother glove-arm from start-to-finish. I went back and looked at more of his pitches to see how common this was, and found that more of his poorly thrown offerings came with the small hesitation and his better pitches often paired with a smoother glove arm. It’s very early to determine if this is a major flaw or just a reaction to jitters or even small sample, but I’ll certainly be keeping an eye out in the future. It was the only inside Fastball to a left-hander that Lopez missed across the entire night and it still earned the out. There’s no question this will be a staple for Lopez – think Jameson Taillon jamming right-handers inside with Two-Seamers – as he spends more time in the majors. I really don’t like this pitch. Lopez’s Changeup has been off-and-on through the night, with a good amount of elevated offerings and Moustakas already crushed the pitch barely foul moments ago. He had fanned earlier in the game with a Curveball down-and-in while breaking multiple bats on inside Fastballs. I understand the confidence Lopez has in his Changeup, though I think a small tweak in approach here will do the trick in the future. Final Line: 6.0 IP, 2 ER, 4 Hits, 3 BBs, 6 Ks. 68/102 Strikes. This game was a tale of two pitchers. The opening frames were dazzling from Lopez, establishing his Fastball effectively to set the tone in at-bats and saving his secondary pitches as bridges to get to strike three or surprise batters with the pitch for a strikeout. However, when facing the lineup for a second and third time, he turned to his secondary stuff a bit too often and it led to trouble. Keeping his no-frills approach from the first two innings through multiple at-bats against the same batters should still warrant positive results given his solid command of the pitch and high velocity. Mechanically speaking, Lopez’s excellent lower half and stable top half spells consistent command. While he does come across the ball slightly, he leads with his front shoulder very well, allowing him to keep momentum toward the plate and minimizing the window for missing his spot. He had moments in this start of overthrowing and overriding his muscle memory, though I can imagine more experience rendering consistent control with all his pitches. Overall, Lopez’s strong foundation in his blistering Fastball sets the tone as a high upside starter. Lopez can nail the armside-and-down spot with the pitch like clockwork, and will overpower batters constantly. He does need to improve his ability to throw Fastballs inside to right-handers with consistency or batters will lean off the plate often, though it’s not a major red flag that will inhibit success. His secondary pitches are good, but not great. He doesn’t have that one offering to turn to as the definitive putaway pitch just yet, though there is upside in his Curveball to be that weapon if he focuses on throwing the pitch below the strikezone often. His Changeup was the most common secondary pitch of the night – sometimes too common – and while seeing Lopez have confidence to throw it in any count, its execution needs to catch up as the pitch was elevated way too often. There’s certainly room for Lopez to take another step in his ability – refine his breaking ball, mix his Fastball/Changeup better, improve his ability to throw arm-side – but even with his current skill set, Lopez should be owned in all 12-teamers and can be very serviceable down the stretch in 2017. While this start didn’t showcase massive depth in his secondary pitches, it’s possible he can quickly make a few adjustments to be a crucial part of your pitching staff, even in a 10-teamer. Let’s hope he can take another step forward as he faces the Texas Rangers on Thursday. We hoped you liked reading Pitcher Spotlight: Breaking Down Reynaldo Lopez’s 2017 Debut by Nick Pollack! For one, I enjoy original content. Secondly, I really like the human element of your analysis. Too much analysis is just a bunch of numbers without context. Thanks for sharing your knowledge with us.